Last night Connor McDavid became the third rookie in Oilers history to score five points in a game joining Dave Lumley (February 1st, 1980) and Ryan Nugent-Hopkins (November 19th, 2011). RNH and McDavid tallied five points in their 19th NHL game. Lumley did it in his 50th game, and Wayne Gretzky (who wasn’t considered a rookie due to playing in WHA) had his first five-point game in his 49th career game on January 30th, 1980, the game before Lumley tallied five. McDavid and his linemates, Jordan Eberle and Benoit Pouliot, put on quite the show last night, and Oilers fans should get used to watching special performances from McDavid. After the game I looked into the history of the Oilers, and reached out to Elias Sports Bureau to fill in the stats I couldn’t research myself. John at Elias is a wealth of knowledge and helped me find out some numbers connected to five-point games in Oilers history. Taylor Hall had the most recent five point game, April 3rd, 2013 versu. the Flames. Nugent-Hopkins is the second youngest player in NHL history to score five points. He was 18 years and 221 days young. Jack Hamilton was 18 years and 185 days when he tallied five points on December 4th, 1943. 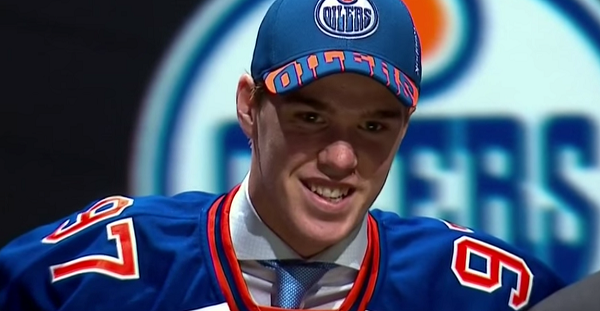 McDavid is now the ninth youngest. RNH and McDavid potted five points in their 19th NHL game, but many have done it quicker. Al Hill had five points in his first NHL game on February 14th, 1977. Hill would play 221 NHL games, and his best NHL season saw him scored 16 goals and 26 points. Joe Malone and Harry Hyland scored five goals in their first NHL games on December 19th, 1917. John told me McDavid became the 23rd Oilers player to score five, or more, points in one game. I researched and found McDavid, Hall, RNH, Sam Gagner, Ales Hemsky, Dustin Penner, Doug Weight, Alex Selivanov, Jason Arnott, Petr Klima, Bernie Nicholls, Jimmy Carson, Esa Tikkanen, Glenn Anderson, Mark Messier, Jari Kurri, Paul Coffey, Kevin Lowe, Pat Hughes, Lumley and Wayne Gretzky did. (I’m waiting for Elias to get me the other two). The most ridiculous stat involves Gretzky. He had a mind-blowing 79 five-point games with the Oilers in 696 games. He averaged a five point game in one of every 8.8 games. He averaged almost nine 5+ point games every year for nine years. He was so much better than everyone else in the high-scoring 1980s. He also also had a four-point game 79 times! So in those 158 games he had a combined 743 points!!! Jari Kurri is second on the Oilers with 14 five-point games, and Paul Coffey did it ten times. Which is very good, but not close to The Great One. I’m not comparing him to Gretzky — it is impossible and unfair to do that to any player. McDavid is very special, however, and hockey fans should get accustomed to watching him light up the NHL. Eberle scored his first career hat-trick last night. He had 18 two-goal games before scoring into the empty net. He became the 55th player to register a hatty in an Oilers jersey. It was Eberle’s third four-point game. Benoit Pouliot registered his first four-point game. He had picked up three points five times previously. McDavid had his first of many exceptional nights. Get used to it Oilers fans, and be sure you enjoy it. Now hopefully everybody wakes the f up or we are going to have trouble with the Peg. Seriously, it is a team of big boys, we better be ready to play tomorrow or we are going to get embarrassed. LETS GO OILERS, lets aim for 85 points and a bunch of changes in the summer and not relying on top 5 overall picks. We are out of the playoffs but it would be great to go down with a fight. Now let’s trade that plug some think is the second best LW in the game Hall so that we can have some actual NHL defensemen feeding Mcdavid the puck and sit back and enjoy! We have finally have our real star…. Now build a team around him. Hall is not a support player, he wants to be “the” guy and he’s not anymore and never will be. There’s a reason 6 years into his career he was never made captain. He won’t be this teams leader, that is McDavids future and I don’t really see hissy fit Hall as a follower type. See I don’t really agree with your take and I’m the biggest oiler skeptic going. I think Hall is a douchebag. I think he’s selfish, self entitled and a bit of a hot head. But that’s also why I kinda like him. He’s not exactly a team leader, but he’s a fantastic hockey player that plays hard with passion and wants nothing more than to win. Put him on a good team and I think he’d be a catalyst to winning in the playoffs. Put him on a bad team and I think he’s a star player that can’t carry a team. That gives him what? 4, maybe 5 years left of his prime years? Same with Eberle. I think most realistic fans would agree the oilers won’t be contenders for Atleast 3 years ‘IF’ Chia makes smart moves and things finally start turning around. Steve Yzerman played on a crap team in Detroit for many years before he started winning and Hall can still win here with McDavid! So Hall needs Mcdavid to create a winning team? How many years did we waste waiting for these players to have potential before drafting Mcdavid? Wait…. what would we be talking about right now if we didn’t win a random 10 percent fluke draw for Mcdavid????…. Like I said Detroit sucked for years and loaded up on some pretty good players as well. Along with Yzerman they had a guy named Lidstrom. So don’t blame Hall on the fact that he has never played with an NHL defense. Sorry bud this this teams lack of success isn’t on Hall! HUH!?!??? Best Oiler night in and night out. Consistently been a top ten scorer in the NHL and he’s the problem? Lack of goal tending and porous defense has been the problem. Out of the entire rookie class of the Oilers he’s the best player. You may not like him, but it’s the truth. (Connor aside). Trading HaLL for any defenseman available would be a HUGE MISTAKE! Unless L.A. is parting with Doughty. Here’s hoping we don’t become that team with the best player in hockey that can’t win in the playoffs. Since we can’t even get to the playoffs, or even close to it, We got a long steep hill to climb, and we’re carrying heavy anchors in upper management. “In my life there’s been heartache and pain. Hey Gregor, how many NHL players have scored more than 395 points in their career? This is the equivalent of 5 points in 79 games. Leadership! Leadership! Leadership! Let management, coaches and players identify the leaders on this team (if they can’t we are in trouble) and then build accordingly. I saw leadership last night in two players, McDavid and Talbot. Ebs and Pouliot were good and Davidson was fine but I saw only two leaders. I’m not saying that Hall and Dri are not but they showed little last night. We may need to wait until Klef and Nurse show up as well. We need a core of skilled players but just As importantly we need leadership in the room. Curtis lazar has worst stats than Yakupov, has less pedigree, has played with better players and has been given a better opportunity to succeed. How do we win that trade? I think we win it when yak bolts to the KHL cause he’s not living up to the hype.I love the player love his energy but he’s lost.Thats on the organization we all know that.Give Yak a fresh start and bring a western Canadian kid home. Is there absolutely no accountability anymore in this world? We live in pass the buck times where its easier to blame others then do some personal reflection and try to improve. I wish Yak well too, but his lack of production is mostly is own doing. The only player averaging more points ts per game is Kane. McDavid has a small same size, but that is still pretty impressive. Be sure you enjoy it buddy. Did Damphousse and/or Murphy score five pts or more? Am I the only person wondering what this has to do with anything? Damphousse did it twice. Once with the Leafs (March 12, 1988 against the Hawks), and once with the Habs (Jan 12, 1998 against Tampa). Not aware of Murph ever getting 5 pts. But I could be wrong. Wow it sure is great to all those D men with windburn from Connor whistling past. Do you think they are going to hit IR? Rod Phillips said on many occasions how lucky he was to be watching the Great One night in and night out. We could all tear a page out of that book watching Connor. Let’s go Connor! Show this team full of willy nillys how a number one draft pick is supposed to change a team!! PLEASE be the first first overall pick on this team that actually means anything in overall team performance!! This is the problem I have with Hall haters. One player doesn’t make your team a winner. Just because Hall couldn’t drag one of the worst NHL teams of all time into the playoffs, doesn’t mean he’s the issue. McDavid had his first of many exceptional nights. The Columbus game, three points including THEE goal, was not exceptional? All of this garbage isnt worth Mcdavid for me. When the polls get posted, something like 80 to 90 percent of the “fans” say it was worth all this crap because we now have Mcdavid. That shows me that only 10 to 20 percent of the people on this site are true oilers fans. It even gets instigated by Baggedmilk as a writer on this site saying it was worth every bit of ten years just to get one single player. I would trade Mcdavid now, to have had a competitive team the last ten years. You would trade what might end up being one of the top 5 guys of all time to fix some crappy seasons . I think what McDavid is going to bring in the next 15 years will be absolutely amazing. Something that may never come along again!! What is the “definition” of a true Oilers fan? Never forget everyone is different and we all have our own opinions. I want to believe as Oiler fans, we share a common goal…to hoist the cup again.It doesn’t matter how the hell we get there, just get there. We can’t worry about the ten friggin’ years management wasted, but we can look forward to the future and hopefully Mcdavid is the spark in that locker room that will equate to wins. Can we please start to look forward and quit whining and crying about the past 10 years. Get over it. It is what it is or was. Gretzky had a mind-blowing 79 five-point games with the Oilers in 696 games. So what you’re saying is that over his nine seasons (696 games, averaging 77 games per season) as an Oiler, Gretzky scored 5 pts a night for what amounts to an entire season (79 games). Before Connor got here we had Hall becoming one of the best left wingers in hockey without veteran leadership in the top six. He excelled despite the Oilers being a horrific organization and now that the shiny new toy is in town some fans want to see him fail that I do not get. Hall has been a real good pro this year and he has done everything to help Connor adjust to NHL life and that makes the Oilers a better team. Fix the defence and things will get better it is really that simple. Hearing that the cap might go down by 4 mil has me wondering if PC can poach a few teams that will be in trouble. After this year, other than Ferences contract, the Oilers don’t really have a “bad contract”, maybe he can get a solid dman or 2 for picks like what NYI was able to do with trades with Boston and Chicago. I don’t really see the cap going down that much, but I definitely see it staying the same as it is right now, and that could still be beneficial for the Oilers, imo. This off season will be interesting on many fronts for the Blue and Orange. I’m glad there’s finally a competent GM running the ship and not one who Dithers about or one who can’t asses players properly and hypes players up when there’s no need for it. Could see some “NHL 16” type trades come July, LOL! Gregor, do you still think that if McDavid would not have been injured that the Oilers would have just got another 5-6 points during those 37 games, given they lost so many 1 goal games? What percentage of Gretzky’s games did he have no points in his first five years in the NHL?